STRASBOURG, France (CNS) — The 77-year-old grandson of European immigrants to Argentina, Pope Francis urged the European Parliament to value the continent’s faiths and recuperate a sense of responsibility for the common good to rejuvenate Europe’s social, political and economic life. 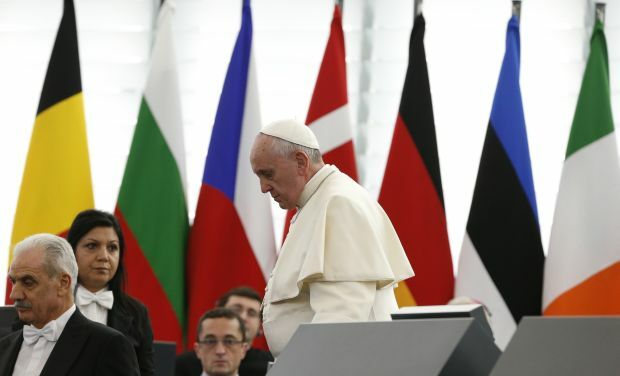 Pope Francis, the first non-European pope in almost 1,300 years, was scheduled to spend less than four hours in Strasbourg visiting only the European Parliament and the Council of Europe. It was the shortest foreign papal trip ever and the first that did not feature at least one visit to a church. Because it was organized strictly as a visit to the European institutions, the pope traveled to and from the airport in a closed car, not the popemobile. Along the route from the airport, scattered groups of a few people waited at the intersections with smartphones or cameras in their hands. There were plenty of French police lining the route, but the only significant groups of bystanders were at the tram stops. Instead of making a pastoral visit, Pope Francis went to the heart of European unity and bureaucracy: the European Parliament, the legislative arm of the 28-member European Union; and the Council of Europe, an organization of 47 countries formed to promote democracy, human rights and the rule of law on the continent. The only other pope to visit the European Parliament was St. John Paul II in 1988, a year before the Berlin Wall fell and marked the beginning of the end of a Europe divided into democratic West and communist East. The original inspiration for European unity was the “transcendent dignity” of the human person, a dignity that endowed each person with inalienable rights, which could be respected most fully in a democracy, in peace and with special concern to help the weakest members of the community and the world, the pope said. Christianity, he told the parliamentarians, not only helped forge the Europe of history, but it continues to offer values and services, particularly in education, that can provide a firm foundation for a renewed future. Protection of the environment, an agriculture policy that respects farmers and the land, improving employment rates and handling migration are particularly urgent, concrete problems that require a response honoring the transcendent dignity of the human person and recognizing the realities of this world, he said. As the Italian government continues to decry a lack of European Union solidarity and assistance with the thousands of migrants who cross the Mediterranean seeking freedom and a better life in Europe, the pope insisted the response to migration must be continent-wide. “We cannot allow the Mediterranean to become a vast cemetery,” he said, referring to the thousands who have drowned trying to cross from northern Africa on rickety boats.